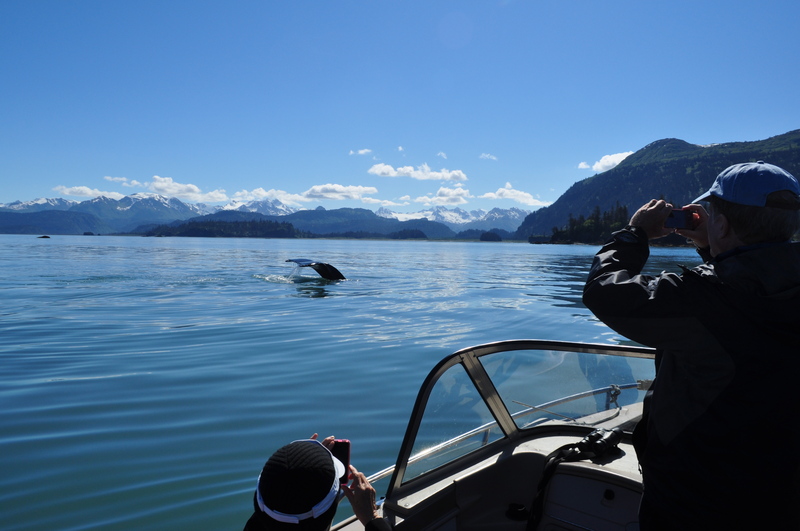 My guests and clients want to see whales, so I am on the lookout for them, every day. 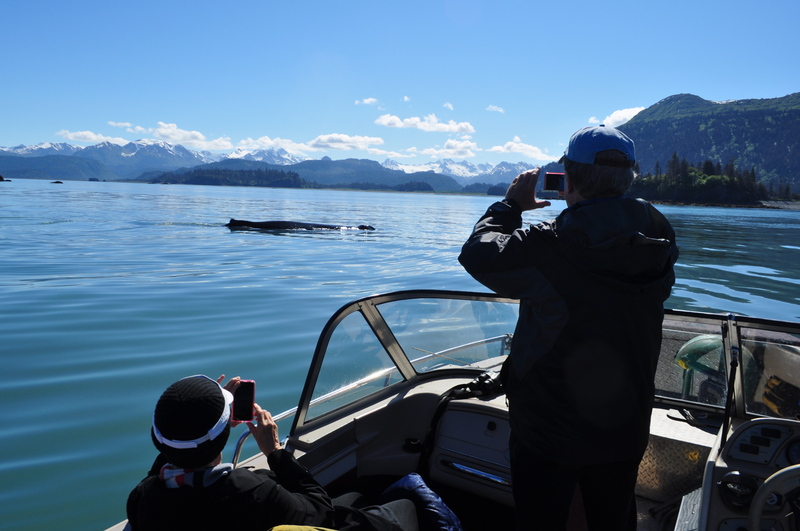 Whales have not been as common in Kachemak Bay this year, as compared to last year by this time. I expect they will be coming, but just arriving later. Yesterday morning, I was out on the bay with Doug and Shirley, from Texas. We had just finished viewing some sea otters, a mother and a pup, and had decided to move on. 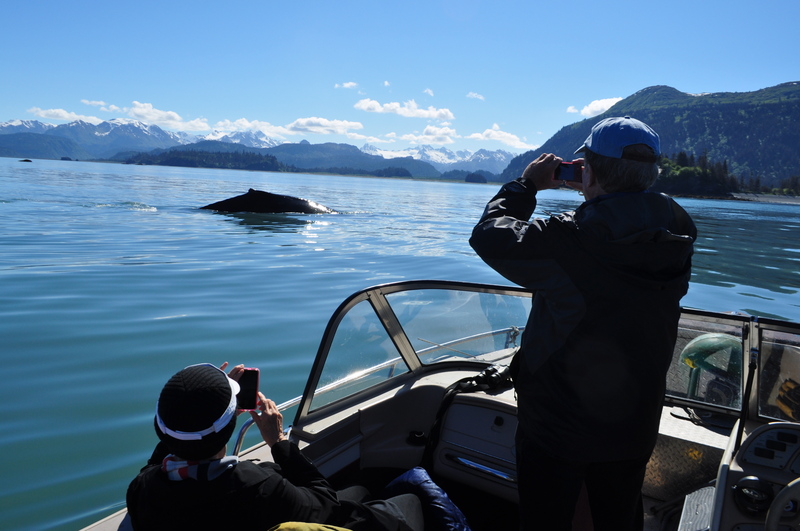 I turned to look ahead, and there was a large humpback whale swimming right at us – just a hundred yards off the bow. We held tight and anticipated it’s next surfacing. That anticipation is hard to explain for me – but it’s something like this. You really don’t know if they are going to come up a quarter mile away, or right next to you. A quarter mile away is no big deal, but humpbacks have a habit of surprising me – that is, coming up and blowing right behind me, and scaring the crap out of me in the process. Some people say that I am a whale magnet, and it is true – but that’s another story. 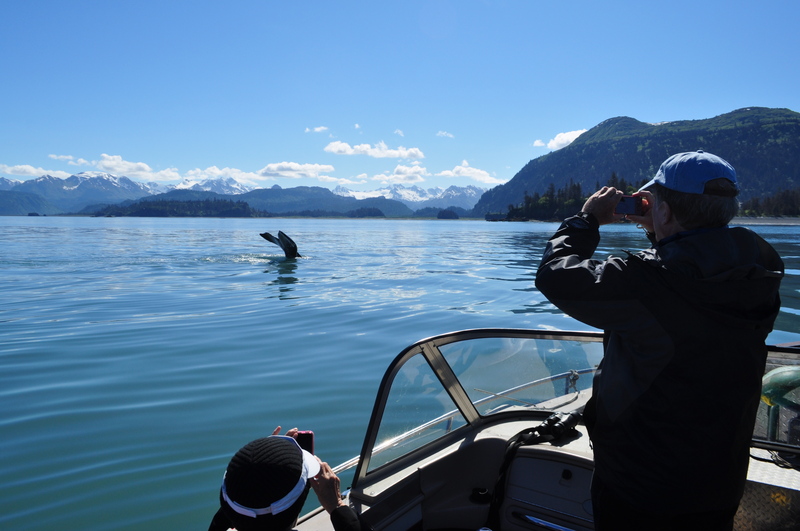 Anyway, sure enough – this humpback surfaced 30 yards away, and displayed some unique behavior. Usually, they are on the move – swimming gracefully, coming up for a breath, gaining momentum as they swim and showing their back (hence their name) – before showing their famous tail shot as they dive for the deep. This whale just surfaced horizontally, not moving, and lay on the surface – apparently just taking a break, or a breather. It blew first and then just stayed there, stationary, exercising it’s lungs. Maybe it was an old grandpa or grandma whale, I don’t know, but it was sure cool. I got a photo of Doug taking pictures of the whale with his little point and shoot camera, and Shirley, taking a video of the whale with her cell phone, and the whale tail in the background as it finally decided to go for another dive. The combination of the glassy, calm water, and the beautiful mountains in the background, and the gorgeous clear blue-sky day, made it a memory that will last. And that’s the way it is on K-Bay. You can go looking for them, and sometimes not find them this time of year. Or, you can just go out and do your thing, and the whales find you! Enjoy the photo, and always remember, this could be you, at Majestic View. Really good job on website. I continue to share it with friends. Thank you.